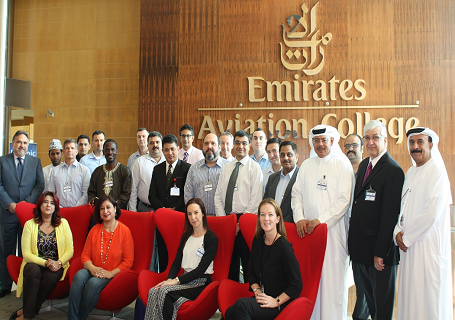 Organised by Emirates Group Security (EGS) - Centre of Aviation Security Students (CASS), the programme was held over two phases – from 10th to 14th August and from 26th to 30th October. The course is accredited by the International Civil Aviation Organization, in collaboration with the Concordia University of Canada, EGS’s Centre of Aviation and Security Studies (CASS) and the Arab Air Carriers Organisation (AACO). The course, administered by academics from Concordia University of Montreal, Canada and ICAO practitioners, comprises two (2) weeks of classroom sessions and separated by ten (10) weeks of rigorous distance learning modular. Demanding very high standards from the participants , the course exudes a very rigid examination and certification process which requires assignments and on-line test have to be submitted to the University and an examination and a comprehensive project based presentation . The collaboration between ICAO, AACO and CASS is aimed at improving educational and professional development opportunities for the industry at a local, regional and international level. Centre of Aviation & Security Studies. Run in close partnership with Edith Cowan University of Western Australia and several universities worldwide e.g. Open University of Malaysia. The centre provides high-quality, university-recognized training and education-based programs.